Please meet Drew, my 1968 boy with NP eyes. I love this boy with his gorgeous, non-falling dark hair and expressive eyes. Drew was found at an auction house here in the States and he came in his original denim outfit with white sandals. He also has held on to his plain back gold wrist tag. Drew is wearing a great short set made by the talented Lorraine. He is holding his faithful pup, Duke. A close-up photo of Drew’s eyes for those who would like to see the eye painting in more detail. I thought Drew would look nice in this Betsy May outfit. I had bought it with Finn in mind but sweet Finn is happy to share with his brother Drew. Finn looks nice too in this same outfit. Another photo of Finn, Fetch, and Faith. This is the sweetest boy named Jimmy. He is a 1968 brunette, denim boy that came from Ellen Church’s collection. Jimmy was sent to me in this handsome shirt and brown corduroy pants with leather belt and boots. Ellen kindly sent his original blue denim outfit with him and I have it stored with his name attached. I seem to collect the brunette boys and have a few here at Sasha Shangri-La so I do try to identify their outfits while they are stored. I added the brown cardi this winter since it has been so cold. Jimmy’s puppy is named Jabo and they are never far apart. A nice close-up photo of little Jimmy. I too love the brunette boys even if some of mine do have slightly falling hair. Luckily the lads don’t mind if their hair isn’t ever brushed. These three are particularly handsome and it’s great when some of the 1968 Gregor’s have the NP eye painting. I wished that I had taken a leaf out of your book and labelled their original clothing as I took it off them before storing it away BUT it always became a job to be done later BUT never got done… so now I don’t suppose I have a clue as to whose is whose! Great that they each have a dog for their very own pet. Probably way more fun than the usual Teddy Bear! Oh how much I have enjoyed your blog and such beautiful dolls,I can really feel the love you have for them with every photo,thank you so much for sharing with us and please,please carry on doing so….today I am in love with little Jimmy,the cutest lad ever!! I too am falling for these young chaps having bought one myself from Shelly’s and he is just so cute…..keep up the lovely pics Ginger…mesmerizing indeed !!!! Well, these 3 boys are truly exceptional. (And of course the unmatched Finn!) The different eye painting really gives them distinct personalities. I don’t know that I have ever seen a philtrum boy with no philtrum eyes like Drew’s; outstanding, Ginger. 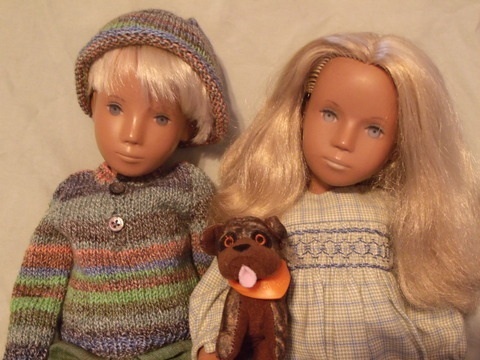 I am really enjoying your blog, the photography and even the little thumbnails of your dolls. (I hope you add them all! It is educational just to look at them, what year they are, etc. in addition to just the sheer delight of their little faces.) Thank you Ginger! While I have tagged original outfits with their doll I have learned from you to label the new clothes that I purchase so I can identify the talented seamstress who made them. they’re all so handsome your boys, and good to see Finn and Faith getting a mention in amongst the brunette lads. 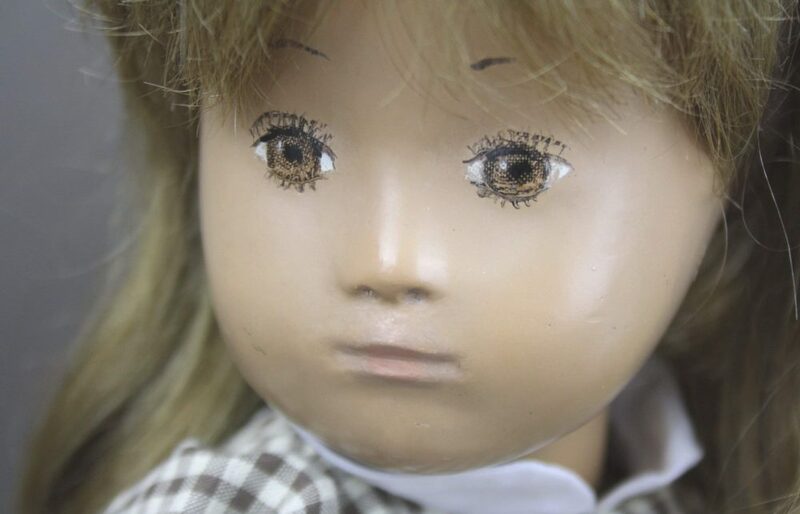 I love the eye painting on those early Trendon dolls. I have to say that I also love the brunette boys, they are all so different and so handsome. Your little boy called Jimmy is my favourite, there is something very soft and dreamy about him, he’s very very sweet looking…and very much suits his name. It would be very easy to get carried away and have more of these lovely boys, they are all so different and all so very appealing! Thanks very much for sharing Ginger!